It’s happened to everyone: You hear a movie theme song and it gets stuck in your head for days. Even if a movie is a big stinker, the theme song can stand out as the high point. These are all unavoidable earworms, guaranteed to drive you mad with joy. 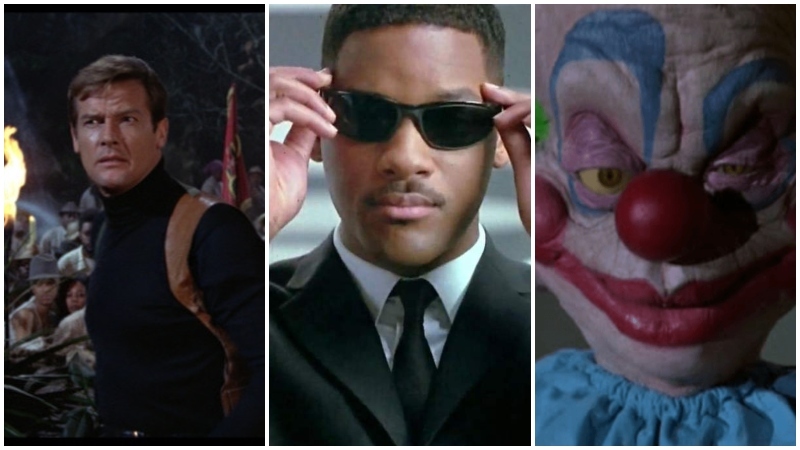 Get ready to tap your feet, nod your head, and sing along as we list the catchiest movie theme songs of all time. This is a catchy little march from the zany parody of 1950s monster movies. It totally gets you into the goofy mood you need to be in for the film. This theme evolved along with the sequels and the spin-off kid’s TV show but maintained the same catchy beat. Watch the movie now on Amazon. The best part of this theme is that Laine thought it was a serious song for a serious Western, so he sings it with pure conviction. This almost makes it funnier than every other song written by Mel Brooks. Lasso this film on Netflix. Speaking of singing with conviction, Queen wrote and performed the theme and soundtrack for this sci-fi adaptation, and this song is arguably the best part of the movie. It gets the audience above where it needed to be for the rest of the film. This wonderful tune is just as recognizable as the NO GHOST logo from the film. It’s immediately iconic, catchy, funky, and fun. The star-studded music video is also one of the best. Trap this movie on Neflix. This fun theme gets you going and suits the on-the-road antics for this classic comedy. It’s so catchy, the 2015 remake had to play it several times throughout the film. You can’t discuss movie themes without bringing up Kenny Loggins. Along with “Footloose” and “Danger Zone,” there’s this groovy hit from the golf/gopher comedy which is catchier than both. “P.T. Barnum said it so long ago / There’s one born every minute / Don’t you know?” You’re definitely a sucker if you haven’t seen this horror/comedy. This theme song, in all its punk rock carnival music glory, is the perfect companion. Not to mention the awesome video above. Watch the movie now on Hulu. Written by Paul McCartney, this song gets into your blood. There have been plenty of catchy James Bond themes, but the catchiest one has to go to this upbeat jam from the Roger Moore adventure. This sweet jam from the hit film stands out as Smith’s most well-known theme. It was one of the biggest songs of ’97. Plus, a singing and dancing alien is the coolest. The neuralizer didn’t work. We all remember this one. This song from the hit action/comedy is one of the catchiest tunes of all time. If you can hear this without moving your feet, you might be dead inside. While not necessarily as popular as Axel’s instrumental theme, it’s an addictive number and was actually written with the intention of being on the soundtrack to another ’80s film, Streets of Fire. Watch Beverly Hills Cop on Amazon. Written by Trey Parker and Matt Stone, this goofy little gem of a theme song is making fun of songs like “Eye of the Tiger” and “Fight to Survive.” Truly these are some of the most complex and poetic lyrics ever written for a theme song. This rockin’ song from the beloved adventure comedy is definitely one that sticks in the brain, along with Lewis’ other more specific hit, “Back in Time.” That’s the power of Huey Lewis. This might be one of the catchiest and well-written themes of all time. In fact, this film’s entire soundtrack is amazing. Yes, Freddie, you are immortal. No man can be your equal. Watch Highlander on Hulu. While not as well-known as his theme from Shaft, this song from Hayes’ own starring movie may just be catchier. Many people will probably recognize this song from Kill Bill Vol. 1. This freaky, funky song from the hit film will get stuck in your head for days. It’s a perfect theme for this pop ’80s teenage comedy, with its nods to the classic Frankenstein films. The post The 15 Catchiest Movie Theme Songs appeared first on ComingSoon.net.